Chancellor Dennis J. Shields discusses the changes to be made in the university's mission statement that was last improved in November 2002. University of Wisconsin System Regent Margaret Farrow paid a visit to the University of Wisconsin-Platteville campus to review its newly revised mission statement, Nov. 4. UW-Platteville’s current mission statement was approved by the UW System Board of Regents in November of 2002. Chancellor Dennis J. Shields has proposed to implement a new mission statement that will communicate the kind of campus that students, staff and faculty want UW-Platteville to represent. Farrow further explained that if a mission statement is too lengthy, nobody will take the time to actually read it and understand what the establishment strives to achieve. Shields said this newly revised statement has taken nearly two years to create and is shorter than the previous mission statement. Moreover, it is much more concise. In order for the new mission statement to be approved, a regent from the UW System was required to attend a forum and listen to the proposed ideas. Farrow encouraged members of the audience to voice their opinions of the new statement, which ranged in topics from what they liked about the new one or if things needed to be modified further. There was a unanimous agreement from those in attendance that the newly revised statement completely represents our campus. Shields emphasized how the new mission statement brings together the different schools that UW-Platteville consists of. Similarly, Farrow said that she enjoyed how, even though the statement is brief, it represents the different schools the university has, regardless of how different they may be from each other. 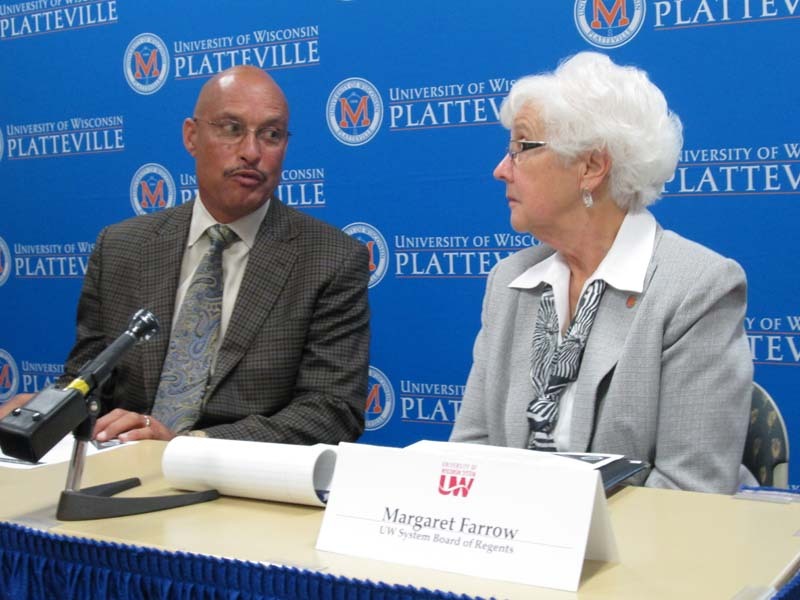 Farrow and Shields both agreed that students, faculty and staff will internalize the new mission statement, due to its ability to represent a diverse people and how it emphasizes UW-Platteville’s personal, hands-on approach to learning. An audience member pointed out that one way to assess the effectiveness of a mission statement is to remove the university’s name from the statement entirely. If the reader is still able to distinguish which school the text is addressing, then the statement is effective. Farrow applauded the fact that the new statement dares to address ethical issues; it shows how UW-Platteville cares to not only educate but also create well-rounded individuals. “Every student that graduates from this system, specifically from UW-Platteville, will be a leader,” Farrow said. The UW Systems Board of Regents will vote on the proposed, new mission statement at the next board meeting in December.